A Citizens' Petition Calls For A New French President: Barack Obama : The Two-Way He's got "the best resume in the world for the job," according to the "Obama 2017" campaign. They even have a slogan: "Oui on peut!" (That's French for "Yes we can"). Some 27,000 people are on board. 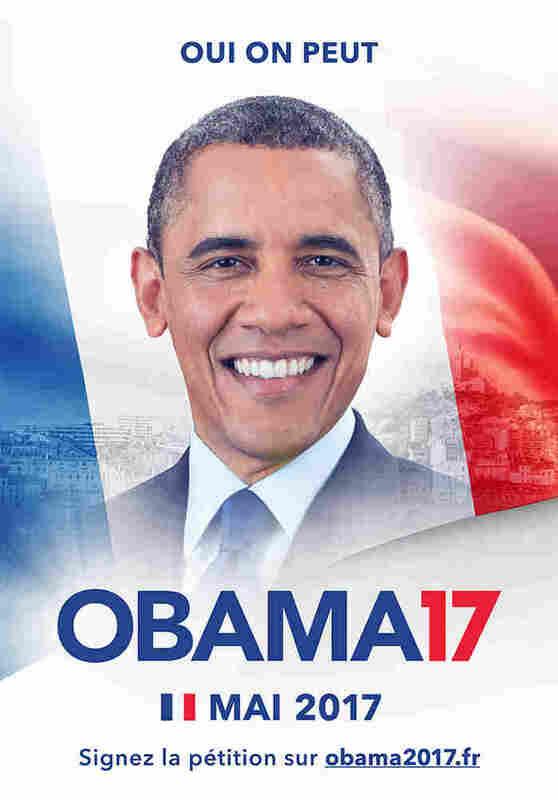 The "Obama 2017" campaign is attempting to "persuade" the former U.S. president to run for office again — in France. Earlier this week, the Obama 2017 campaign was launched, calling for the former U.S. president to step forward as a candidate in the French election while there's still time. "Barack Obama has completed his second term as President of the United States," the site says. "Why not hire him as president of France? ... [He] has the best resume in the world for the job." Posters for Obama 2017 have been plastered around Paris. The slogan, of course: "Oui on peut," French for "Yes we can." And a campaign-style website is gathering signatures to persuade Obama to run. It's not the first time French citizens have expressed longing for Obama's leadership — at least two petitions were started last year — but it's by far the most successful. According to the site's organizers, some 27,000 people have signed the petition so far. A group of four friends — "basic 30-year-old guys from Paris" who work in creative industries — came up with the idea "after a drink," according to one of the people behind the site. He asked NPR not to use his name, to avoid possible legal consequences that could damage his career. "We were thinking about French politics and saying that we were fed up with the fact that we all the time had to vote against someone," he says, "and how it would be cool to be able to vote for someone we admire. We came up with Obama." "I think the whole world would love to have him as president," he says. We should note that in order to run for president in France, Obama would have to be naturalized as a French citizen. Also, he doesn't speak French — although Michelle Obama studied the language in college, according to a biography. Anyway, that's not really the point. "It's definitely a joke," says the co-creator of the site. "But it could make people think a little bit about what we could do differently in French politics. ... the idea was to make people wake up." Obama 2017 isn't meant to rally support for any French candidate or party, he says — it's an expression of frustration about politicians in France in general. "Always the same people, here for 20 years, coming up from the same schools, giving ministry [positions] to their friends," the co-creator says. "We don't know politics," he says, referring to the group of friends behind the site. "We aren't coming with real stuff. We're just proposing something to make people think." NPR has reached out to Obama's personal office for comment; so far, there has been no reply.